Thought we left him behind? Easy on the chocolate and gravel. Maybe just go with what u know, some good german chocolate always helps I am sure. As for the single lady and the married seminar...u nerd. She probably feels like she missed out on an opprotunity to meet some singles. Not everyone is as lucky as you and meets the women or their dremas in high school. thanks for keeping us updated. I will choose not to take offense at the slight diss on people from the prairies. 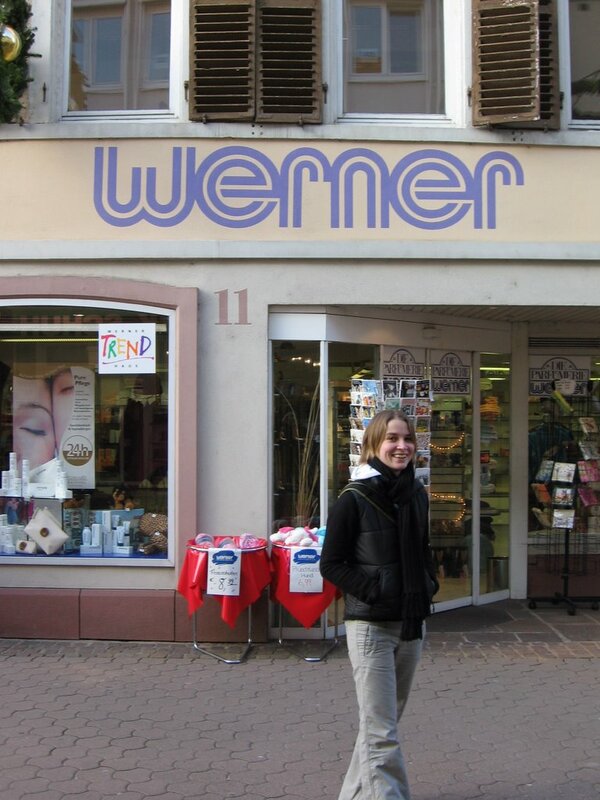 I like the "Werner" pic. Enjoy your seminars. Cool photo! What is it of? A record store or a women's clothing outlet? Too many Q's and not enough A's. Soak as much of it up as you can. You never know when or if you'll get back. Are you feeling 'Hundgry' yet? Har-dee-Har-Har! ~ chris! Hi guys. I love reading your blog. Keep it up. Eat some Milka 'choco & cakes' for me. glad that you are now answering some of the many questions being asked.....hope you bought some of that verner perfume! SO I talk to the infamous "VERNER" the other night and never new his fame. He figures with this jump to "Cyper Space", as he would say, the possiblities for his stardom is endless. I think he appreciates that you are still thinking of him. Barb is waiting for her name to come up. See what u can do!! I still think it's funny. Oh and will eau de Kyle smell like Kyle before or after peanuts!! What I meant was he never knew his fame!! Just to clarify. I guess it pays to proof read.